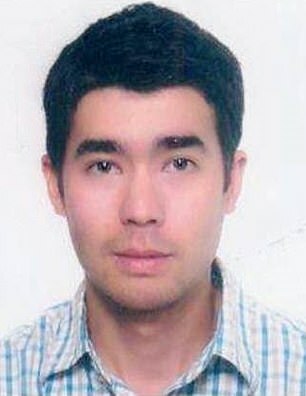 Many news-telling organizations are uninformed and completely WRONG in the stories they write about American John Allen Chau who was recently killed on North Sentinel Island in the Andaman and Nicobar Islands chain in the Bay of Bengal, east of India. So, FOR THE RECORD, let’s set this all straight. 1.) John Allen Chau was NOT a “missionary” of any kind. He was about as much a “missionary” as fictitious group The Blues Brothers – Dan Aykroyd and John Belushi – in their absurdist 1980 comedy movie, who in character claimed they were “on a mission from God.” Chau NEVER made any such claim. 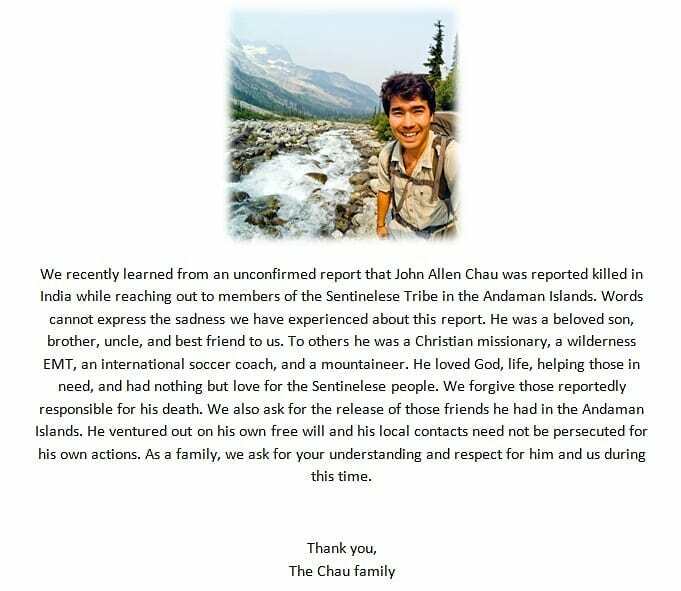 Instagram obituary of John Allen Chau, 27, by his family. 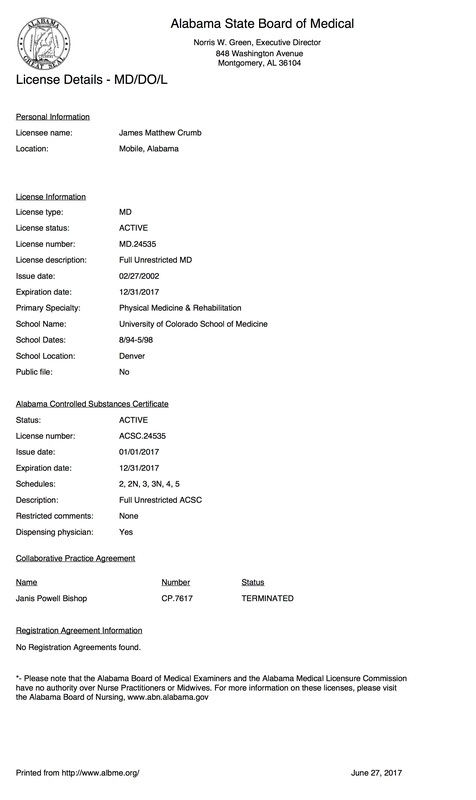 The Department of Justice, United States Attorney’s Office, Southern District, announced that Mobile, Alabama physician Dr. James Matthew Crumb, MD (AL license number MD.24535, AL Controlled Substances Certificate ACSC.245, National Provider Identifier: 1629079793 ) a Physical Medicine and Rehabilitative physician who currently practices as Mobility Metabolism and Wellness (MMW), and a local neurosurgeon group Coastal Neurological Institute, P.C. (CNI), 3280 Dauphin Street, Suite A, Mobile, AL 36606-4060, (NPI:1740212174), have collectively paid $1.4 million to settle allegations that they violated the False Claims Act (“FCA”) by engaging in fraudulent schemes to maximize payment from the Medicare, Medicaid, and TRICARE health care programs. Does it come as any surprise that the Multinational Corporation BP has no allegiance or loyalty to anyone or anything save their profit, executive compensation and shareholder payouts? And yet – as astute observers note – politics makes strange bedfellows. Appointed by President Obama, Administrator Feinberg is being paid by BP in excess of $10 Million annually. But… would Democrats have expected this kind of “favor for the people” from their president? (Reuters Legal) – There has never been anything quite like Kenneth Feinberg’s $20 billion Gulf Coast Claims Facility. Established to compensate victims of the BP Plc(BP.L) oil disaster, it essentially invests one man with full power over how the money is distributed, while he is being paid by the company and unsupervised by any government body. Alabama Gov. Bob Riley has urged BP PLC and President Barack Obama to make sure that Gulf Coast residents don’t have to sign liability waivers to accept claims payments. Oil spill claims czar Ken Feinberg recently launched the second stage of his claims process, in which he will offer people final settlements or interim quarterly payments. For the untold numbers of iPhone users whom even occasionally use the WordPress blogging app, I have ONE suggestion: STAY AWAY from the UPDATE to version 2.6! Having been a faithful customer of Apple, and of the iPhone, I am experiencing increasing discontent with what I perceive to be very careless, lackadaisical, even malicious failures of developers to be attuned to the iOS and issues of compatibility, or even operation! It’s akin to going to a restaurant, ordering a two eggs omelette, and having the raw ingredients dumped in your lap by the cook. Meanwhile, the hotty-totty waitress smiles and coos, asking if you’d like a refill on your coffee. We promised to pay your retirement pension, but now, we won’t. Sosumi… you bastards! For those “in the know,” “Sosumi” is the name of a computer sound which Apple Computer of Cupertino, CA created and has used for quite some time. I love Apple Computer, well, not genuinely “love,” but have always believed them to be the best – bar none – computer operating system, superior in every way to Microsoft’s Windows OS. Folks used to say, “Oh, the Mac is good for graphics,” and other such nonsense, even when the Mac OS was in v7.x. Today, I ask folks, “What’s the Internet all about?” Graphics, graphics, graphics, and media, media, media. And still, some folks continue to use the infection-prone Windows. Oh well. Some folks never learn. Don’t much follow a whole lot’a sports. Not even the holy grail of NCAA Division I’s SEC – by many, the standard by which all other football teams are judged. On occasion, however I will watch an Auburn game and make every diligent effort to tune into the Iron Bowl – THE gridiron rivalry to end all rivalries. And, I confess to rooting for Auburn. Been that way for a long time… rooting for Auburn, that is. You see, when you quite literally owe your life to Auburn, you know where your priorities are. Yep, that’s owe my life to ’em, as in I-wouldn’t-be-here-if-it-weren’t-for-Auburn kind of owe my life to ’em. Anyway, the article told about how MRI confirmed that Inside Linebacker Dont’a Hightower suffered ligament damage and would most likely be sidelined for the remainder of the season… for appropriate surgery and recuperative therapy. I wish him a speedy recovery and the team well. But what aroused my curiosity more than anything was this fellow’s name: Dont’a. My fingers have a hard time wrapping around that apostrophe, so it seems. Because almost every time I type it out, I find myself needing to back up and correct. Just exactly what kind of name is Don’ta… er, I mean Dont’a? And having never heard the fellow’s name pronounced, I’m unsure of the pronunciation. I mean, is it properly pronounced “dah-n-tay,” “doughnna,” or what?! Then I thought again, who names their child something like that? It’s definitely not an American name… at least I couldn’t find it anywhere I searched. And what does it mean? Names have meaning… at least that’s what we’re taught when we begin learning to speak. We associate a word and sound with something. And eytmologists – that’s not the folks that study bugs, but the folks that study the origin and derivation of words – tell us that most of all language can be traced back to a common tongue. Dont’a you do that no mo! I’se gwine ta’ whip ‘yer arsicle if’n ya’ do! The pleasing sounds of the varieties of our Southern dialects continues to amaze me, and hearing the sweet-as-honey sounds, and the tenor twangs of the many voices we’re blessed to have in ‘Bama is a rich cultural hearitage… er, I mean heritage, that rivals any place I’ve ever travelled. From the mountain foothills of Northern Alabama’s cuCumberland Plateau, to our wiregrass fields and blackbelt forests, to the Mobile Bay’s oysters and shrimp, the vocal tonalities and rhythmic cadences of our speakers all contributes to our state’s mysterious and equally lovely appeal. As many attest, her greatest appeal is her people. Sure… what state or location doesn’t have their own idiosyncrasies? But we love our idios, to be certain! I mean, we love you, don’t we? There’s no place like home… there’s no place like home… there’s no place like home.